To get there by car you have to use the back entrance that is located in Duffryn Street. The map from Google below shows the way from the Afan Road (A4107) (see Red Arrows). (You will pass the Afan Lodge and an old school building on your left, then you will see a little hall type building on your left (this is the church), the turning if shortly after this). If you miss the turning, 100m ahead after the Post Office there is a sharp right that leads you up a very steep lane that will also get you to the property (Black Arrow). 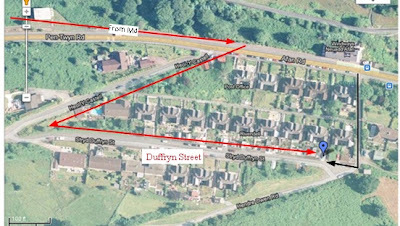 Once you reach Duffryn Street, the property (blue marker) is last but 3 on Left the Red line, or the 3rd one on the right on the Black Line.